aSTharatha pratardana; bhImarathasyeti divodAsasya visheShaNam. This sarva-medha vedic ritual is higher than ashvamedha, and it will be performed when a king conquerors every bit of the earth. Other reading: sushAnti is termed as puru-hèti who begot bahu-ashva; with va ba yoH abhedaH, the above vAhyAshva will become bahvashva, whose sons are the above five. The episode of somaka and his Vedic ritual will be in vanaparva of mbh. Here ajamIDhAt = sahadevAt. sudhanvana’s son is the intelligent suhotra. His son is chyavana who is well-read in the Vedas and other scriptures. chyavana's son is kR^ita-yaj~na. Celebrating many sacrifices that pious king kR^ita-yaj~na begat a son equal to indra in glory. He is vasu, the king of chedi-s, who could range in the sky and move about in the air. 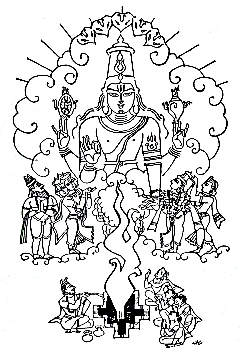 The son of Turvasu was Vahni; his son was Gobánu; his son was Traiśámba; his son was Karandhama; his son was Marutta. Marutta had no children, and he therefore adopted Dushyanta, of the family of Puru; vi. pu. Wilson. angAra's son is gAndhAra who established gAndhAra province. Prior to this angAra is said to be a nomadic in desert lands, maru bhUmi-s, training nomadic fighters on horseback - turaga Aroha kushalAH, with whom he attacked mAndhAta and failed. suchetasa has hundred sons; all the dynasts of anu have become non-confirmists of vedic canons - dharma virahitA-s; they became the lords of mlecCha provinces, and collectively called as mlecChA-s. Thus, this is the thirty-second chapter of first canto called harivamsha-parva, in harivamsha-purANa, the sequel of mahAbhArata, narrating puru dynasty.